This review was completed in May 2008, where I expressed a lot of love for the 69ep h bag, but had some reservations about the lack of shoulder straps. 69ep clearly listened and it's been updated, which will explain why some pictures have the strap and others don't. Bags are bags are bags - well almost. For DJs, they tend to follow a fairly similar format - either boxes or rucksack style are the favourite. But sometimes, something different comes along that turns your head enough to make you look twice. The 69ep h bag is one such head turner. Designed specifically for Scratch Live users, it oozes quality in all areas. You feel like you want to take a look at it - to pull open the secret zips to see what’s going on inside. Trust me - it’s worth the look. 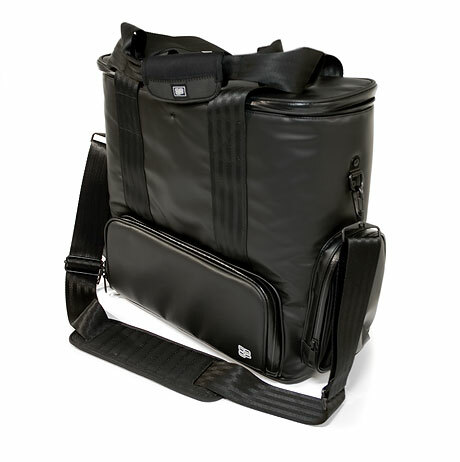 Image is everything - even for DJs, and the 69ep h bag looks unlike anything I’ve seen before. The very first impression is one outstanding design. If Apple or Bang & Olufson made a bag, it would look (and cost) like this. It’s as if 69ep simply glanced at the bag making rulebook when designing this bag, but just went off in their own direction. Sure it has pockets, but it’s the way they’ve been implemented that counts. 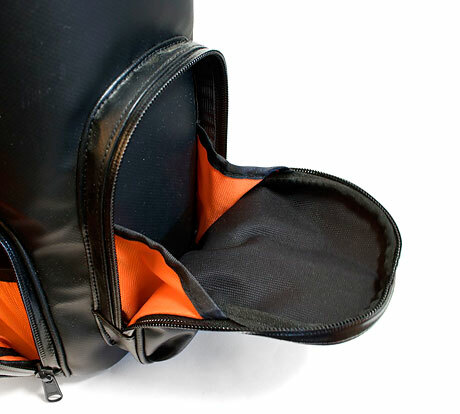 The zips are hidden - almost invisible in fact, giving an extra level of protection for the gear inside. There are no clips to break or detract from the overall design either. There are handles of course, but made from seriously strong strapping - the same stuff as seat belts are made from. The overriding feeling is one of quality. 99% of bags on the market are made from some sort of woven Nylon. It’s tough, cheap and easy to work with. But 69ep clearly weren’t happy with following the crowd and instead went with something entirely different - matt finish Polyethylene. According to their site, it’s military tent material meaning its non-flammable, meaning it’s probably resistant to everything but a nuclear attack. It certainly raises the perceived quality bar significantly and is likely to look good for much longer than the Nylon brigade. Before we dig inside the bag, let’s look briefly at the outside. If you open up the side pockets, you’ve got a little space for the assorted nick nacks that you carry around with you - cables for example fit in these, or perhaps even your car keys. Even here, thought has been given to the function - the inner flaps have been added to keep everything inside. 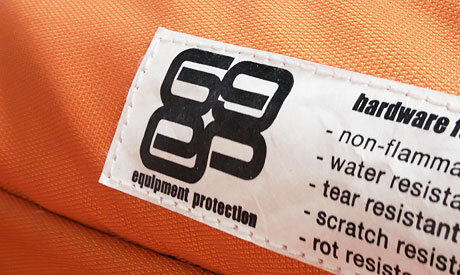 Aside from the obvious quality on the outside, the guts of the 69ep h bag have obviously been thought about at length. Being a Scratch Live optimised bag (the Orange is a dead giveaway), the guts have been specifically designed with the laptop DJ in mind. 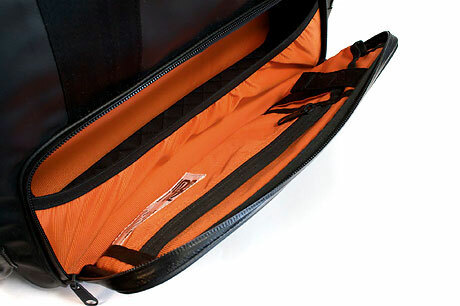 Built with a semi-rigid construction from Orange Nylon, there are compartments specifically for your laptop and SL1 interface (or any other for that matter bar the Torq Conectiv). There’s also a space for the optional heavyweight cart case (more on that later). There’s a little bonus inside the front pocket - a handy space underneath the various compartments for bigger items such as headphones and bulkier cables. Inside the flap you’ve got some handy pockets for slim things like CDs or iPods. The big surprise about the innards of the bag is that it’s all modular. Each part is independently fixed in with metal poppers, allowing you to have as much or as little of it as you want. You can even clear the whole lot out, leaving a big quilted space for old fashioned records and maybe a CD deck. It does however seem to be much more of an accessories bag than a generic box lugger. The overall minimalism has been carried through to carrying the 69ep bag. As previously discussed, the carrying straps are made of heavyweight seat belt strapping, and the hand straps are folded, stitched and finished off with a removable sponge rubber hand support. 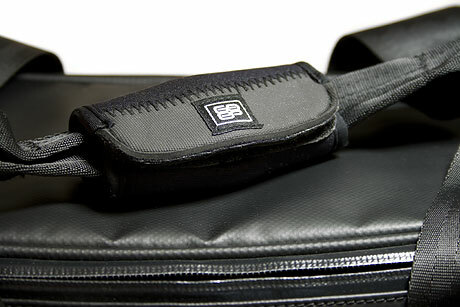 Even though the bag isn't likely to get that heavy with your DVS setup, it's a very handy thing to have. 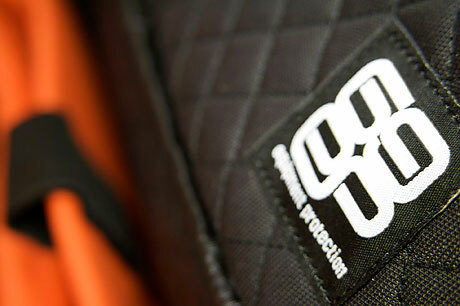 As well as the hand straps, the 69ep bag also has a removable shoulder strap. Again, this is the same heavyweight material as all the other straps, and comes complete with a wide and firm shoulder support. In use this is extremely comfortable, and even when fully loaded with the guts out and a mixer and laptop in place, it feels like I could carry it around for longer than some other bags. It always seems like shoulders are a neglected are of bag design, but not so with the 69ep bag. 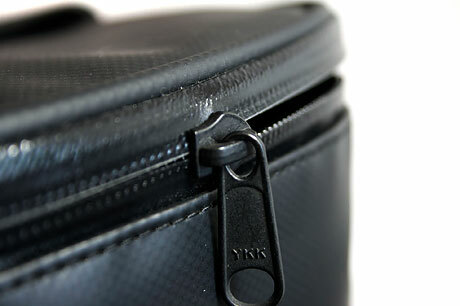 The weak point of any bag tends to be where the straps are fixed to the body. In the case of the hand straps, they're stitched along their entire length, so there's little chance of that coming away. 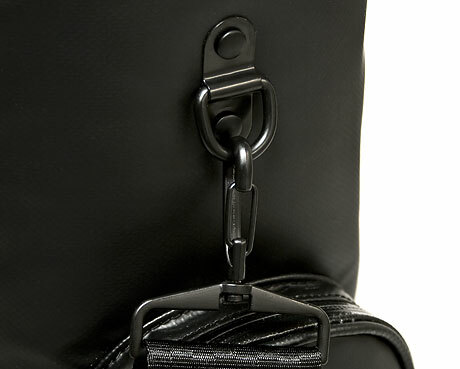 The shoulder strap however is rivetted to the rigid body via metal fixings. On the face of it, this could be a weak spot but after loading it up and giving the straps some seriously excessive tugging, my belief is that they should stay put. But while they've been clearly designed with the minimalist theme in mind, I would have felt more comfortable if they were a tad more substantial. Being able to use the 69ep bag like a ruck sack would be nice for some people, but I never carry a bag like that so I'm not really missing it. But you'll want to bear it in mind if you fancy one of these. Complimenting the 69ep h bag is the Needle Case. 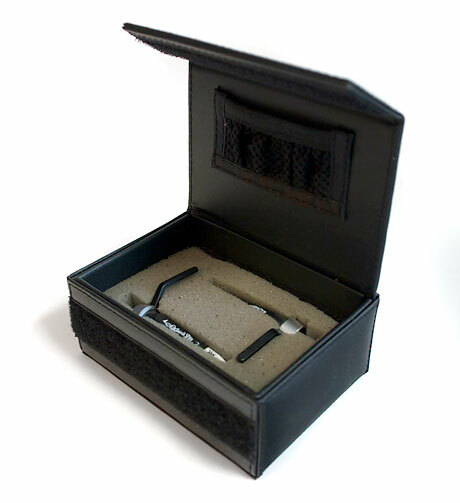 It’s a diminutive piece of solid work, made from the same military material as the bag and clearly designed to protect your carts. I know because I’ve stood on one and my carts survived to tell the tale, leaving the case unharmed. Each one comes with 2 sponge innards - one designed for Concorde and one for headshell mounting carts. There’s even Velcro inside to keep the sponge in place. 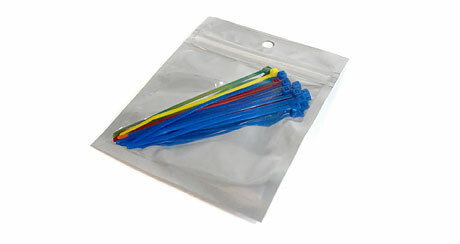 And there’s the tiniest of small mesh pockets for your spare needles as well. 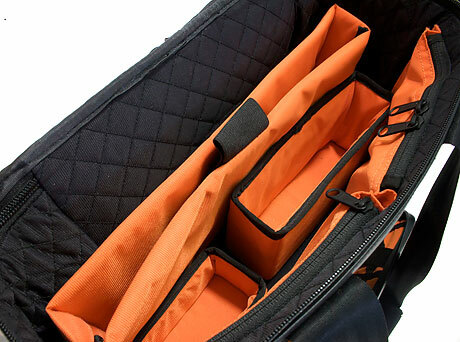 The 69ep h bag has been designed to make Scratch Live users DJing experience a little easier. There’s a special place for your beloved SL1 box, but it’s a little cleverer than that. Plugging and unplugging is always a cabling nightmare for SSL users, but with the enclosed colour coded tags, you can label up your cables and keep them connected while still stuffing the entire thing - interface and all - back in the bag. I love fresh approaches to old ideas. It would be easy to bring out yet another bag that while doing the job, doesn’t change anything. Like I said before, a bag is a bag is a bag, but the 69ep h bag dares to be a little different. 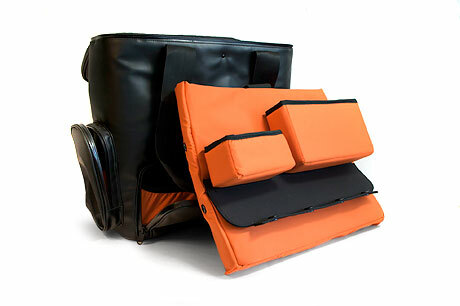 It’s a stunning piece of work - high quality materials, hidden zips and a fully configurable guts. The shoulder strap is especially comfortable, although some may miss the ability to use it ruck sack style. As far as DJ luggage goes, it's pretty much bang on for the digital DJ and I love it. It isn't for everyone, and unless you take out the inside compartments, its function is quite specific. But they may well have a winner among the slightly better off DJs out there looking for something that will look after their investment in expensive DJ gear. It's certainly got enough head turning appeal for the more image conscious DJ as well. Military grade material, sealed zips and seatbelts for straps. Awesome. It's all been done very well with a very specific function in mind, but the lack of ruck sack straps may put a few off. Interesting... available only from 69ep for payment in dollars. The weak dollar means some bargains can be had, unless you're American. My rating is based on sterling value for money. 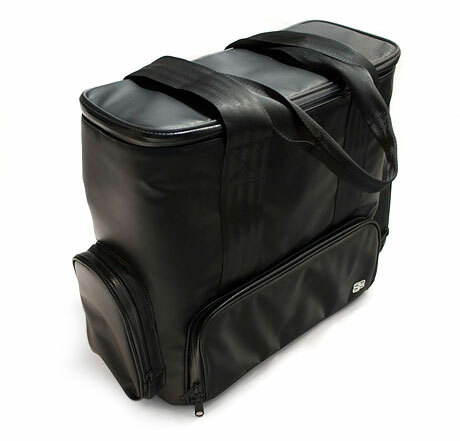 For an unknown brand, this 69ep h bag is a quality product that digital DJs will love.